Whole Spice will be offering a 20% discount the last three days of October so you can stock up on all your favorite spices and herbs! In the meantime, try this delicious cauliflower frittata recipe, which can be served for breakfast, lunch or dinner! The spice used is the so-called “French curry,” Vadouvan, believed to have come out of a French settlement in India. Ghee: In a heavy-bottomed vessel, melt the butter over medium heat. There will be lot of bubbling and gurgling. Don’t panic. Reduce the flame to low; in a few minutes this action will subside. Next, the butter will begin to develop foamon top. Simmer over low heat, uncovered and undisturbed, for 30 to 45 minutes, until the milk solids on the bottom of the vessel turn from white to beige-brown, and the butter on top becomes transparent, like clear water. This is the signal to turn off the heat. Please take caution not to burn the bottom part. That would lead to a scalded-milk smell, and the solids would stick to the pan. All the effort would be a waste, and you’d have to throw everything away. So never use high heat to make ghee. After turning off the heat, let the ghee stand uncovered for 10 minutes. With a spoon, remove any crust that rises to the surface. Strain with a coffee filter, discarding the milk solids at the bottom of the vessel. Fritatta: Transfer the strained ghee, which should now be a light-brown color, into a pan. Add chopped shallots and saute over very low heat for about 20-25 minutes until shallots are caramelized. This is a very delicate process — please make sure not to burn the shallots or the butter. Once the shallots are caramelized, add the Vadouvan, salt and black pepper. Saute for few minutes, then add cauliflower florets. Mix them in and make sure the cauliflower is coated with shallots and spices. Cover your pan and cook for about 30 minutes, stirring frequently to prevent burning. Do not add water. Once the cauliflower is soft, pour in the eggs and cook without stirring, until the bottom of the frittata is just set, about 2 minutes. Lift the edges of the frittata and tilt the pan to allow the uncooked egg mixture to seep underneath. Continue cooking the frittata until the bottom is golden and the top is just slightly runny, about 3 minutes. Serve over toasted French baguette (you can spread butter on the sliced baguette for extra flavor) and serve with fresh cherry tomatoes on the side. As the weather slowly begins to change, so changes the spices we use during each season. For Whole Spice, nothing says autumn like ginger, cinnamon, clove, and cardamom. Those four spices are blended together to make Hawaj coffee spice, which can be stirred into black coffee, tea, or baked goods. It makes a delicious Chai Latte when brewed with coffee beans and then blended with cream. Try this Whole Spice recipe to start your mornings off on the ‘ripe’ foot! The blend of flavors enjoyed in Yemenite coffee also makes for spicy and fragrant baked goods, like these muffins. Preheat the over to 350 degrees.In a large bowl, combine the flour, baking soda, and salt, then set aside. In a small bowl, mash one banana with a fork so it will still have a bit of texture. With an electric mixer fitted with a wire whisk, whip the remaining bananas and sugar together “like you mean it,” for a good three minutes. Add the melted butter, eggs, vanilla, Hawaj coffee spice and cinnamon and beat well, scraping down the sides of the bowl once or twice. Add and combine the remaining dry ingredients until mixture is completely incorporated. Fold in the mashed bananas with a rubber spatula. Spoon the batter into the muffin tins filling them about halfway. Give them a rap on the counter to get any air bubbles out. Bake until a toothpick stuck in the muffins comes out clean, approximately 18 to 20 minutes. Let cool for a few minutes before turning the muffins out. Serve warm or at room temperature. Whole Spice will be offering a 20 percent discount the last three days of June! One spice in particular has been getting much deserved attention, and that’s turmeric! It is known for its many health benefits, especially its anti-inflammatory properties. You can buy organic turmeric powder from Whole Spice in bulk for $2/oz ($14.40/lb) or in a jar for $7. Try this Whole Spice recipe for Golden Milk, aka Turmeric Tea! It’s a delicious drink to enjoy the wonderful healing properties of Turmeric! In a saucepan, add the milk, turmeric powder and maple syrup, and bring to a boil. Turn off the heat and allow to cool. Add flax oil at the end. Relax and enjoy the golden milk! Whole Spice has all the spices you need to change up your cuisine for the spring season! Whether you like sweet, spicy, herbaceous, citrus flavor or a combination of all the above, Whole Spice has all the spices for your life! Try this Whole Spice recipe for Moroccan Spiced Carrot Salad, a delicious warm side dish spiced with Harissa and Toasted Cumin! Enjoy! Place water in a 3-quart saucepan and bring to a boil. Add carrots and simmer until they are tender when pierced with a fork, about 30 minutes. Cool. Cut carrots into bite-size pieces and place in a serving bowl. In a small bowl, combine garlic, harissa, toasted cumin, salt, pepper, lemon juice and water. Heat up a nonstick pan and add olive oil. Add the seasoning mixture to the pan, then gently fold the cooked carrots into the mixture. Simmer on medium heat, stirring until the carrots are coated with spice. Place in a salad bowl and add parsley. Whole Spice has all the flavor you need to spice up your life! Stop by the spice shop and try a pinch of ghost pepper salt, Zhug spice, Chipotle chili flakes, or chili lime salt! Better yet, take some home and try them in your next batch of Guacamole! Also, Whole Spice will offer a 20% discount on all herbs and spices during the last three days of March so plan on doing some spring cleaning of your spice cupboards! Halve the avocados and remove seed. Scoop out avocado from the peel and put in a mixing bowl. Using a fork, roughly mash up the avocado (don’t overdo it — the guacamole should be a little chunky). Squeeze the juice from the lime and then add the rest of the ingredients and blend well. Serve with tortilla chips. Enjoy! In a soup pot heat the oil over medium high heat until the oil blooms.Season meat with salt and pepper. Add the meat to the soup pot and cook until the meat is browned on all sides. Add carrot, onion, garlic, and celery to pot. Mix the meat and veggies thoroughly and cook for 3-4 minutes, or until veggies start to soften. Add all three pints of beef broth and he wine, and bring to a boil. Reduce heat to low and cook uncovered for 1 hour or until vegetables and meat are tender. Whole Spice has all the spices you need to warm up your house for these chilly nights! Make yourself this spiced apple cider recipe and cozy up to the fire or serve to friends and family. Whole Spice apple cider spice is sold in bulk or jars, and better check out the mulling spices while you’re there! Also, Whole Spice will be offering a 20 percent discount the last three days of the month, November 28-29. In a saucepan, combine cider or juice, brandy and apple cider spice. Bring to a boil, then simmer over low heat for 10 minutes. Add a slice of apple and cinnamon stick for garnish before serving. Enjoy! As the weather changes and the evenings get colder, there’s nothing better than a bowl of soup to warm you up! Try this Whole Spice recipe for Ethiopean red lentil stew spiced with Ethiopian Berbere spice mix. Stop into the spice shop and get all the spices you need for your next soup, stew, or chili recipe! Whole Spice always offers locals a 10% discount on all purchases over $20, and they also offer a 20% discount the last three days of the month! Cooks note: The traditional Ethiopian berbere spice blend is formed into a paste by mixing it with oil; it is not a must but this process can add more concentrated flavor to the dish. In a deep stew-pot, heat up the oil. Add chopped onion and saute on a medium high heat for 10 minutes. Add chopped ginger and garlic and saute for about five minutes on medium heat. Add Ethiopian berbere spice mix and saute until fragrant. Add chopped tomatoes and saute on high heat for 12 minutes. Add dry lentils and saute for a few minutes than add water and salt. Reduce the heat and simmer on low for 20 minutes gently stirring to prevent burning. The stew should be thick; if you have extra liquid please uncover and cook for 10 minutes in order to reduce the water. Tastes great served over rice and eaten with flatbread as a substitute for the traditional injera bread. Whole Spice shares this recipe for homemade mustard from customer George Vierra. 8 cups white wine (1 bottle of sweet Moscato di Canelliand and 1 1/2bottles of Chardonnay are recommended. Mix the first three ingredients well together in an 8-quart pan, and set aside. Add the rest of the ingredients to a pot and bring to boil. Boil until reduced to half volume. Note…this is very pungent! Open windows, turn on fans, etc. Pour the reduced liquid through a strainer. Discard solids. Pour the strained liquid into the mustard pan. Put this pan over low heat and stir constantly for 10 or 15 minutes, until thick. Pack in sterilized jars. Store in icebox. Fills ten 8-0z. (1 cup) jars. Can keep refrigerated for up to 3 years. Ages and changes nicely. Can change heat level by varying portions of powder and seeds. Seeds are hotter than ground mustard and brown seeds hotter than yellow. Zhug is a spicy blend used to on meats, fish, soups and salads. Use Whole Spice’s recipe to make fresh Zhug paste to garnish hummus or seared tuna. Also, Whole Spice will be offering 20 percent off at the end of the month so stock up on all your favorite fall spices during Oct 29-31. Place all ingredients in a food processor and grind it finely. Place paste in a glass jar and store for up to one month in the refrigerator. Use this spicy paste sparingly as a garnish for Hummus or other dips, added to soups or as a spread for meat or fish. Whole Spice has all the herbs and spices you need to start making delicious soups and warming rice dishes this fall! One of the best spices you can start using is turmeric! Try this Whole Spice recipe for simple yellow rice to incorporate the amazing health benefits of turmeric into your diet! Whole Spice sells organic turmeric powder in bulk and in jars. Feel free to bring in your own container and they’ll fill it up directly! Also, Whole Spice will be offering a 20% discount to locals and OxNotes readers the last three days of the month, September 28-30! Happy Cooking! In a medium saucepan, heat the olive oil, then add turmeric powder and saute for 20 seconds over low heat until fragrant. Add rice, salt and pepper and mix gently until rice has changed color to yellow (a few seconds). Add the water and bring to a boil. Cover and reduce heat to a low simmer. Cook, covered, without stirring until the water is absorbed and the rice is tender, about 20 minutes. Remove from the heat and let sit covered without stirring for 10 minutes. Fluff with a fork and serve. The following may be added: corn, peas, raisins,or chopped roasted almonds. Enjoy!! Enjoy this Whole Spice Blackened Salmon Recipe for a quick, delicious dinner! The principles are simple: A spicy buttering, a well-heated pan, a mouthwatering fillet. *Get the pan as hot as you can without causing the butter to smoke. The essence of this dish is to cook it quickly. Whole Spice will be offering a 20% discount September 28-30! Whole Spice has a delicious Fattoush Salad Recipe for you to try! Get some fresh Zahtar spice blend and sumac during your next visit to the spice shop. In case you missed July’s end of the month sale, Whole Spice will be offering another 20% sale for Oxbow newsletter readers August 29-31! The instructions for this recipe begin with the pita chips, which Ronit blends with Zahtar spice blend for authentic eastern Mediterranean flavor. Preheat oven to 350. Slice the pita into bite-sized squares and place them in a small salad bowl. Drizzle with water and 3 Tbs. olive oil; season with 1/4 tsp. salt and 1 Tbs. Zahtar blend. With your hand, gently mix to make sure all pita bites are coated with spices. Place on a baking sheet and bake for 20 minutes or until golden brown. Set aside to cool. Chop all the vegetables and place them in a salad bowl with the olives. Mix together 3 Tbs. olive oil, 1/2 tsp. salt, sumac, lemon juice and 1 1/2 Tbs. Zahtar Blend, and toss with the vegetables. Just before serving, top with pita chips and feta. Enjoy! Here’s a refreshing recipe from Whole Spice for Tzatziki, a cool cucumber dip, to bring to your next picnic. Mix all ingredients together well and serve with pita chips (below). Preheat oven to 350. Slice the pita into bite-sized squares and place them in a small bowl. Mix water and olive oil and drizzle over the pita squares. Season with salt and pepper. With your hand, gently mix to make sure all pita bites are coated. Place on a baking sheet and bake for 20 minutes or until golden brown. Set aside to cool. Whole Spice will be offering a 20% discount the last three days of the month, July 29-31! Whole Spice will be offering a 20% discount the last three days of the month! Stock up June 28-30 on all your favorite BBQ rubs, like Napa Valley Rub, Harissa Spice, and Chipotle Honey Rub! Mix 1/2 to 3/4 tsp. Whole Spice Harissa spice with 1 Tbs. mayonnaise for each ear of corn. Pull back the corn husks, but do not tear them off. Brush the ears with the Harissa mixture and replace the husks. Grill until the husks are crispy. If you haven’t tried Indian Dal Seasoning, ask for a jar of it at Whole Spice, and then try this recipe for Indian Spice Soup. It is absolutely delicious with red lentils! Whole Spice will be offering a 20% discount the last three days of the month so start your wish list now and stock up April 28-30. In a large pot heat up the oil on medium-heat then add the onion. Fry until golden brown. Add Indian Dal seasoning, salt and stir for 10 seconds. Now add the dal, carrots and zucchini then stir for 1 minute. Add the water then cover and bring to a boil. Lower the heat and cook for 45 minutes. Add the tomato and cilantro. Serve with flatbread of pita bread. Whole Spice will be offering a 20 percentdiscount the last three days of this month so you can spring clean your spice cabinets March 29-31! Also, try this delicious Whole Spice salmon recipe! Just a teaspoon of dried tarragon is enough to bring out the flavor in fish and chicken. It also pairs well with peas, asparagus and other spring vegetables; and it is great friends with mustard, as in this easy salmon recipe. Preheat oven to 450. Mix together the tarragon, mustard, honey, salt, cayenne and lime juice. Drizzle olive oil on the salmon and season with salt and pepper. Place in the hot oven for 10 minutes. Take out the salmon and rub it with the tarragon-mustard mixture. Place back in the oven for 5-6 minutes, until the sauce is caramelized. Serve with fresh vegetables: Whole Spice likes a salad of shaved colored carrots seasoned with salt, pepper and olive oil. Spring is here, Easter is just around the corner, and The Fatted Calf is ready to celebrate. Forget the peeps and chocolate bunnies! 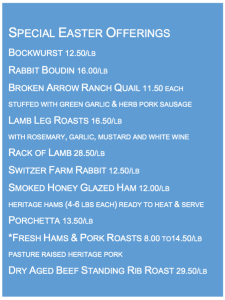 Fatted Calf has a ho st of treats for your spring celebration from chive scented bockwurst to succulent stuffed quail. And don’t forget the bacon, breakfast sausage and farm fresh eggs for a holiday brunch. To place an order for pick up, please email or call (707) 256-3684. This recipe was handed down to The Fatted Calf from Marsha McBride, chef and proprietress of Berkeley’s Cafe Rouge. This savory grilled rabbit spiedini utilizes both the meat and organs of the rabbit, deliciously served over a salad of chicories, olives and almonds, perfect for a spring feast. Cube the rabbit meat into one-inch (2.5 cm) pieces. Season the meat, liver, and kidneys with the sea salt and coriander. In a large bowl mix the garlic, orange zest and herbs with the olive oil and wine. Add the seasoned rabbit. Cover and refrigerate overnight. Prepare the vinaigrette for the salad. In a medium sized mixing bowl, macerate the shallots in the red wine vinegar. Add a pinch of sea salt and the Dijon mustard. Slowly whisk in the olive oil to emulsify. Set aside. Remove the rabbit from the marinade. Wrap the rabbit liver with the pancetta. Thread one piece of liver and one kidney onto each skewer along with ¼ of the rabbit meat, leaving ½ inch (1.25 cm) in between each piece. Grill over a medium-hot fire for about 8 to 10 minutes total, turning frequently to brown evenly on all sides. In a large bowl, toss together the arugula, escarole and frisée with the vinaigrette. Add the olives, almonds and a few grinds of black pepper. Divide the salad amongst four plates. Place a whole skewer, still warm, over the bed of greens and serve. Fatted Calf corned beef is ready just in time for St. Patrick’s Day. You don’t need the luck of the Irish to nab one of these succulent beauties. Just reserve one for pick up by emailing or order by phone at (707) 256.3684. Corned beef is the dish that keeps on giving. At The Fatted Calf, they always cook a corned beef twice as big as they think they might reasonably need in hopes that the next day there will be a hot corned beef sandwich heaped with sauerkraut and caramelized onions and possibly enough shredded end bits for a hearty red flannel hash. Choose a pot that is wide and deeper than your hunk of beef is tall (or possibly a deep roasting pan). Into your cooking vessel toss a leek, roughly chopped, a couple of carrots peeled but left whole, a clove or three of garlic, a stalk of celery and sprigs of thyme and parsley. Situate the corned beef brisket atop this aromatic bed and cover with cold water and perhaps a generous splash of beer. Bring to a simmer then place all of this in a low oven, about 300°F (150°C) for three to four hours. Prod the brisket with a meat fork to be sure it is tender and yielding before calling it quits. Let the meat rest in its cooking liquor for twenty or thirty minutes then transfer it to a carving board and slice it against its grain. Seldom sticklers for tradition The Fatted Calf prefers to cook the requisite cabbage and potatoes on the side. Cabbage sautéed with a bit of Fatted Calf bacon until just tender and finished with a ladleful of the braising liquor is far tastier than the long boiled stuff. A steaming bowl of new potatoes with just a bit of butter and parsley will more than do or try a rustic root vegetable mash. A dollup of creamy horseradish sauce and a pot of strong mustard round out this fine Irish-American feast, a meal so good you may need to ration a bit for the next day’s sandwiches. Try this decadent Whole Spice recipe for chocolate cake drizzled with Urfa chili chocolate cream. Urfa’s heat level of 3-4 on the Scoville scale of 1 to 10, combined with a high essential oil content, makes it accessible to most palates. Melt the butter and add dark chocolate, gently folding until it is all melted. Set aside. Beat eggs and sugar together until thickened. Add the melted chocolate and continue beating. Add flour and cocoa powder, mixing just until combined — do not overbeat. Transfer to a round baking pan and bake at 350 degrees for 20 minutes. Heat up whipping cream, add dark chocolate and stir until melted Add Urfa chili and mix. Drizzle atop the chocolate cake. Cook spaghetti according to box instructions. Heat up olive oil over medium-low heat. Add sliced garlic and stir. Add chopped Calabrian peppers. Sauté on low to medium heat, to prevent the garlic from burning. Add anchovies and olive oil, breaking the anchovy fillets into the oil while making sure not to burn them. Immediately add cooked pasta and fresh parsley, and mix. Remove from heat and serve warm. Looking for new ideas for entertaining family and friends this holiday season? Try this recipe for salt-roasted whole salmon with wasabi mayo and chile salsa from Eiko’s Executive Chef Jake Rand. Wash the salmon well both inside and out, then pat dry with kitchen paper (leaving the scales on helps to keep in the moisture as it cooks). Finely slice 1 lemon into rounds and stuff into the salmon cavity with the sliced fennel, parsley, marjoram and chives. Combine the rock salt, eggs and one cup of water in a large bowl, then evenly spread one-third of the salt mixture over a large baking tray (large enough for entire fish to lay flat), making a slight hollow in the middle to hold the salmon snugly. Lay the salmon diagonally into the tray, then spoon over the remaining salt mixture, heaping it around and onto the salmon so that it’s evenly covered – you should have a layer of salt, roughly 2cm thick, all over the salmon. Place the tray in the hot oven for around 40 minutes, or until cooked through. To test if the salmon is ready, push a skewer through the salt into the thickest part of the fish – if it comes out warm after 5 seconds, it’s done. Meanwhile, make the wasabi mayo. Mix wasabi powder with warm water until a paste forms. Whisk wasbi into mayo 1 tablespoon at a time until desired astringency is reached. To make the salsa, finely chop the chilli and mint leaves (discard stems), then place into a bowl with 1½ tablespoons of extra virgin olive oil and 1 teaspoon of vinegar. Season to taste with salt and pepper, then set aside. Once cooked, remove the salmon from the oven and allow to cool for around 20 minutes, then with the tip of a knife, carefully slice into the salt, cutting all the way along the salmon spine, being careful not to slice into the fish at this point. Gently lift the salt casing off the salmon, then spoon away and discard the remaining salt, brushing away any excess from the top of the salmon. Transfer the fish to a large platter, then score the skin along the spine, across the tail and under the gill and peel back the skin. Divide up the salmon and serve with the wasbi mayo, chilli salsa and lemon wedges on the side. Give thanks for our fresh, local bounty from the sea. Hog Island oysters make a welcome addition to your holiday feasts. Serve as a light yet savory appetizer, raw on the half shell with Hog Wash, Baked Hog Island Oysters Fungi, or try a classic herbed oyster stuffing. Any way you shuck them, fresh local oysters are always a treat. Call 707-251-8113 or stop by Hog Island Oyster Bar to place your orders by Tuesday, November 24 by 5 pm, and pick up on Wednesday, November 25 before 5 pm. All oysters and shellfish are sold live, in the shell. Napastak has an extensive selection of baked goods and bakeware, to help you make delicious bread, pies and cookies. Here’s a simple but delicious recipe for muffins, using Haulin’ Oats and pumpkin spice emulsion, both available at Napastak. Heat oven to 350. Grease bottom only of muffin pan. Combine all ingredients in a bowl and mix together. Pour into muffin cups and bake until muffins are slightly puffed and golden brown, about 25 minutes. Makes approximately 10-12 muffins, depending on tin size.